DIY (Drink-It-Yourself) Xylophone Made From Beer Bottles! Of the things that you could do with beer bottles, this has got to be one of the most glorious. Designer Sam Gensburg has created this special packaging for beer bottles — in this example, the adorably-named “Southern Bells,” — that can be transformed into a tone-accurate xylophone. Once you’ve drunk all the beer, of course. Read on to discover more about this recycled polyphonic percussion set. On the back of each bottle is a guide for musical key-making. You simply fill the bottle with water to the appropriate line, and it will produce that key when struck. With what, you ask? With special batons that come in the box– you make them with the corks from the bottle tops! The bottles can be arranged in a musical line by unfolding the six-pack. Two six-packs make a full octave. Fun times. More toys from things, please! Cool! Where do we find this? Of the things that you could do with beer bottles, this has got to be one of the most glorious. 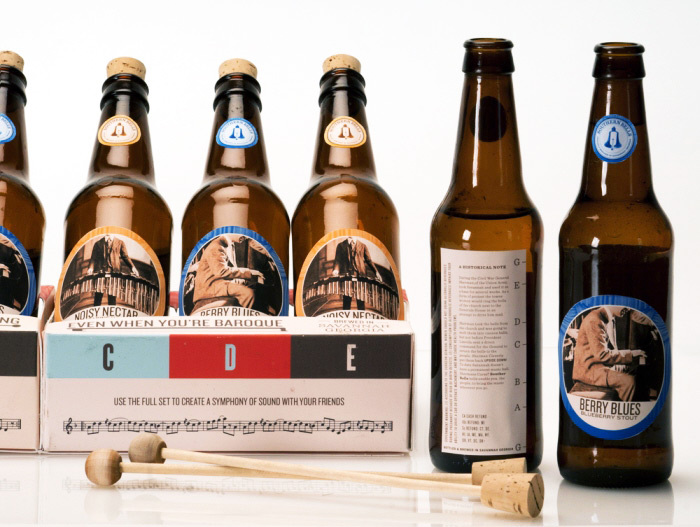 Designer Sam Gensburg has created this special packaging for beer bottles -- in this example, the adorably-named "Southern Bells," -- that can be transformed into a tone-accurate xylophone. Once you've drunk all the beer, of course. Read on to discover more about this recycled polyphonic percussion set.